The pop of champagne – The explosion of fireworks – The sparkle of a Coast Diamond engagement ring. How do you plan to celebrate the New Year? All of the above we hope! The holidays is the most popular time for couples to get engaged; that’s why we call it Engagement Season. Coast Diamond has the sparkling symbol of your love this Engagement Season and the perfect place to find it is at Quenan’s Fine Jewelers in Georgetown, TX. The expert staff at Quenan’s has over a century (you heard it right, a century!) of experience in helping couples find the perfect engagement ring to represent their love. Celebrate the New Year with the sparkle of true love and an engagement ring from our Coast Diamond Retailer of the Week, Quenan’s Fine Jewelers of Georgetown, TX. Which of these Coast Diamond engagement rings is the sparkling symbol of your true love? This Coast Diamond cushion shaped halo engagement ring (LC5257) is one of our most popular halo engagement ring designs. It has maximum sparkle with round diamonds cascading down the shoulders of the band and around the halo. This beautiful symbol of your love can be finished with a 0.50 or 1.0 carat diamond center stone of your choice. Ring in a New Year of dreams come true. The glitter of delicate diamonds and the elegance of our Coast Diamond oval halo engagement ring (LC10233) makes this the perfect symbol of your true love. A hidden diamond adds extra sparkle to this Coast Diamond classic solitaire engagement ring (LC5219). Round brilliant diamonds lead up to the diamond center stone of your choice in this cathedral setting. The peek-a-boo diamond beautiful surprise in this symbol of your love. Quenan’s Fine Jewelry can’t wait to be a part of your New Year’s love story. Give them a call (512) 869-7659 for their holiday hours and stop in for their help in finding the symbol of your true love. Congratulations Quenan’s Fine Jewelers of Central Texas for being our Coast Diamond Retailer of the Week! The Coast Diamond halo engagement ring has been winning hearts for 40 years. They truly represent the grace and romance of a bride-to-be. The diamond experts at Beard’s Jewelry in Jacksonville, FL know the most important element in creating her dream halo engagement ring is the diamond center stone. Beard’s has the largest diamond inventory in North Florida. They will help you find a diamond center stone that sits perfectly surrounded by the halo of diamonds in a Coast Diamond engagement ring. This Engagement Season find the halo engagement ring she’s been dreaming about at our Coast Diamond Retailer of the Week, Beard’s Jewelry of Jacksonville, FL. This petite Coast Diamond halo engagement ring (LC5410_WC5410) is a classic. A beautiful round center stone of your choice is surrounded by a cushion shaped halo of petite diamonds. Our petite halo engagement ring is an award winner and has endless possibilities for customization. The halo engagement ring gained popularity during the Art Deco Era. Our Coast Diamond halo engagement ring (LC5357_WC5357) with pavé set diamonds (0.36TCW) and milgrain edging is the perfect representation of the symmetry beloved of Art Deco design. The most beautiful way to enhance a diamond center stone, chosen with the help of one of Beard’s jewelers, is to surround it with a halo of diamonds. This Coast Diamond cushion shaped halo engagement ring (LC5391_WC5391) is surrounded with smaller pavé set diamonds (0.16TCW) and milgrain edging. Customize this halo engagement ring with a princess cut or pear shaped diamond center stone to make it her dream engagement ring. Congratulations to Beard’s Jewelry of Jacksonville, Fl for being our Coast Diamond Retailer of the Week! The southern brides of Atlanta love glitter and glamour this Engagement Season. 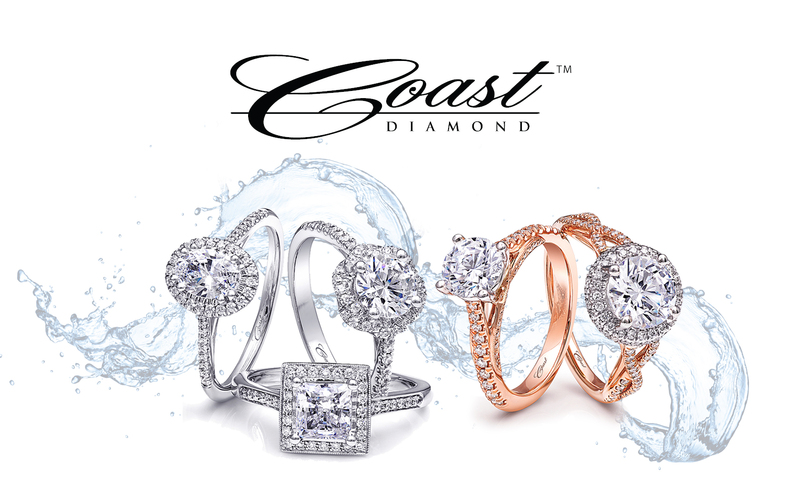 Our Coast Diamond traditional designs, like the solitaire and the halo, are favorites year after year. But the glitter and glamour come from the petite diamond setting of their engagement rings. When shopping for an engagement ring, and a center stone to complete it, Atlanta brides choose the diamond experts at Solomon Brothers Fine Jewelry. Originally from South Africa, The Solomon brothers know diamonds. Buying diamonds rough and uncut, they carefully watch over each step until they become brilliant gems. Once you choose your Coast Diamond petite diamond engagement ring, they will help you choose the perfect diamond center stone to complete it. For their love of diamonds, this week we celebrate Solomon Brothers Fine Jewelry of Atlanta as our Coast Diamond Retailer of the Week. Your Coast Diamond engagement ring with a petite diamond setting amps up the sparkle during the holidays and all year long. The diamonds on the band of the Coast Diamond scalloped band engagement ring (LC10387) are set with micro-prongs (smaller than petite). Smaller prongs allow for more glitter from the diamonds. The fine detail of milgrain edging completes this ring of vintage perfection. Petite prong set diamonds lead the eye to a one carat diamond center stone of your choice from Solomon Brothers Fine Jewelry. This Coast Diamond solitaire engagement ring (LC5386) has a six prong setting for the center stone. The matching petite prong set diamond band (WC5386) makes this set wonderfully elegant. The split band diamond engagement ring is a continuous Coast Diamond best seller at Solomon Brothers in Atlanta. This glamorous Coast Diamond halo engagement ring (LC5392) has petite round brilliant diamonds on the split band and around the halo. The matching band (WC5392) is slightly curved for a snug fit. Congratulations to Solomon Brothers Fine Jewelry of Atlanta, GA for being our Coast Diamond Retailer of the Week!